What's the most dangerous way to liberate hostages? A definitely 70s action movie centred on a fad, that's not related to disco or skateboarding. With a great cast and a Lalo Schifrin score, shot in 2.35 widescreen, this movie could still fly today (if it were ever given the chance of a DVD release). A gang of Baader-Meinhof (style) terrorists, disguised in hockey masks, invade a wealthy industrialist's home and kidnap his wife (Susannah York) and two kids. For a lot of money and ammunition he can buy them back, but the Greek police (led by Charles Aznavour) don't want to give in to their demands. So while the husband (Robert Culp) is dealing with the police, ex-husband (James Coburn) tries to sneak into the baddies' hideout, high in a mountain-top monastery, and free the hostages by himself. How on Earth is he going to do that? Hang gliders. For a while they were everywhere. James Bond had a high-flying stunt in Live and Let Die (1973). But the film that top hang glider experts recommend is Sky Riders for some of the best and most dangerous footage of the sport in its early days, before the fliers wore parachutes! The skateboard movie 'genre' was aimed at kids and teens (encouraging them to try dangerous stunts like riding under moving lorries on their skateboards). But this pitches itself as a tough, adult thriller, completely contrary to the serene feeling of flying high in the sky without an engine. Hang gliders as action vehicles are also limited by their close resemblance to sitting ducks. The opening kidnap is dramatic enough, with a detectable censor cut excising the death of one of the staff. There's then a long lull in the action as the rescue mission is planned, practised and mounted. Though it's fun to see some experts pretending to glide badly, standing in for Coburn's character as he's learning how to fly. The fantastic, barely accessible location of the monastery, surrounded by natural sheer-walled mountains, is visually spectacular. Note that in the above photo there is more than one monastery. According to the Wikipedia entry, there are actually six surviving clifftop monasteries in the Greek valley of Meteora, each one perched on a natural sandstone pillar. One was used in the finale of For Your Eyes Only (1981) and maybe the same one was in the live action Tintin and the Golden Fleece (1961). Horror fiction fans take note that Max Brook's novel World War Z also uses Meteora, a very handy place for hiding from zombies. I'll leave you to work out which monastery was in each - the Wikipedia article has handy photographs of each one. The gliding mission would be more exciting if we knew how technically dangerous it all is. 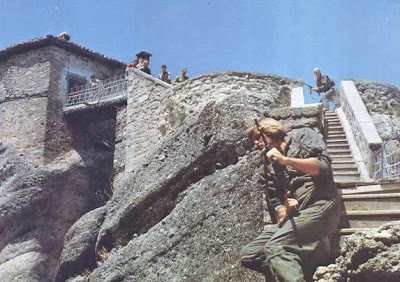 No real hints are given as to how hard these flights are as they glide between the mountains, and luckily the armed guards seem oblivious to the whole exercise, as they sneak up to the fortress. Unluckily, their escape plan gets complicated. The action ramps up as the police decide to storm the fortress as well, regardless of the fact they're endangering the hostages, oblivious to the rescue plan already underway. This loophole logic is purely to get as much firepower on the screen as possible. 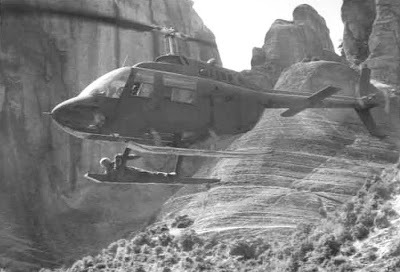 An astonishing 'high' point of the movie is James Coburn performing a perilous stunt hanging off a helicopter hundreds of feet in the air. Not essential cinema, but a reminder of when big action scenes had to be shot for real. The story of the making of the film would probably be equally interesting. But this has a strong cast, stronger than the storyline anyway, and a gung-ho finale. 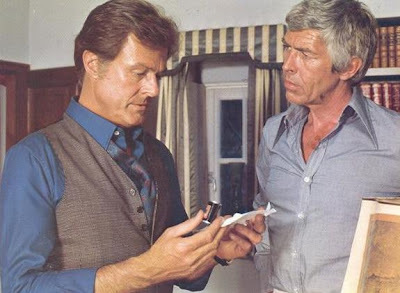 Robert Culp (the original star of the TV show I Spy) looks convincing on the big screen, at a time he was fighting to escape endless TV movies, and the story starts as if he's going to be the central character. But James Coburn (Our Man Flint, A Fistful of Dynamite) sneaks in later to steal the movie and all the best scenes! Seventies Brit-chick Susannah York (The Shout, Gold, Superman - The Movie) gets good mileage out of facing up to her female captor. Eccentrics Kenneth Griffith and Harry Andrews pep up the cast list but only get one scene each. Hunky John Beck (between supporting roles in Rollerball and The Big Bus) is largely wasted, despite being in the rescue squad. I'm not a slave to auteur theory, but director Douglas Hickox did give us several cult movies that still endure - Brannigan (1975, John Wayne as a Dirty Harry-style cop wreaking havoc in London), Behemoth the Sea Monster (1959, another dinosaur wreaking havoc in London) and the marvellous Theatre of Blood (1973, Vincent Price as a Shakespearean serial killer wreaking havoc in London). 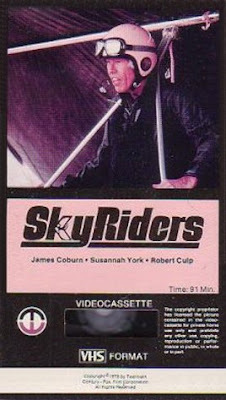 After catching most of Sky Riders on TV in the eighties, I wanted to try the whole film again, only to discover the VHS was going for silly prices on eBay. I can only blame the hang gliding fans, but it also renewed my interest. It isn't on DVD in the UK or US but I'd really like to see it in the original 2.35 widescreen. I've only ever seen this as a cramped pan-and-scan version on TV and on laserdisc. 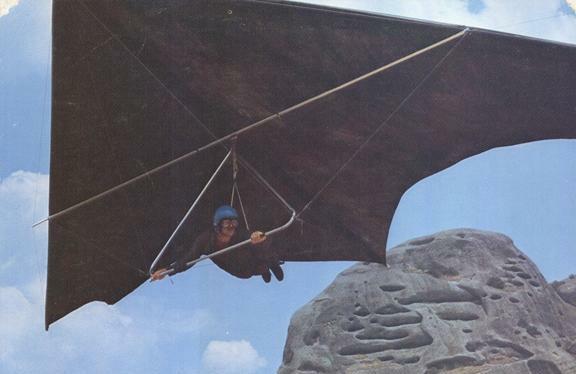 Everard Cunion's hang gliding site reviews the film with notes about the hang gliders and stunt pilots. This might be available as a legit DVD release in Spain, but there's no clues if it's widescreen, otherwise I'd pounce on it, like tiger. I too enjoyed this movie! I still have that very same VHS videotape in my video collection, with the same cardboard box cover as pictured on your web page. The tape was released by Magnetic Video (later became Fox Video)in the 80s. As with most VHS tape releases at that time, the film is presented in full screen. Sadly, the tape is pretty worn out now. Like you, I really hope someone still remember this entertaining thriller and release it on DVD in widescreen someday. Happy New Year! Always enjoyed reading your reviews! Mr. Soo, Malaysia. I would like to have one VHS videotape with Greek subtitles. Sorry, Mix, no idea! eBay is your only hope. But also look out for a DVD, now that it's out in the USA.